Published on July 11, 2010 in corruption, Crime in T&T, General T&T, International, Law, People's Partnership, Politics and USA. 26 Comments Tags: CIA, Cuba, Injustice, Israel, Palestine, Raffique Shah, Terrorism, USA, Venezuela. 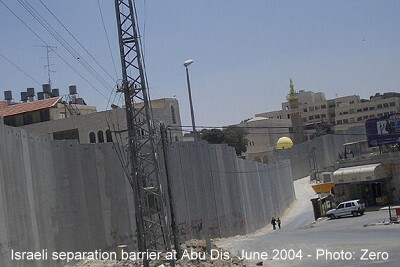 This picture shows a portion of the barrier being built by Israel in the West Bank. This is close to the eastern part of Jerusalem. THOSE among us who keep abreast of international developments will have noted huge protest demonstrations in Israel most of last week. This kind of action is unusual. Small numbers of Israelis who oppose their government’s policies towards the Palestinians and atrocities committed by their military, hardly come out in the open for fear of their lives and liberty. Last week’s protests were not only big, but apparently supported by the state apparatus.